June has always been inspired by beauty, color and creativity. After formal art instruction, studying drawing and art history at the University of St. Thomas in Houston, TX, she continued with various other learning venues and private instruction, exploring many forms of creative expression. After attending a particularly inspiring workshop by Frank Janca, (who was a student of David Leffel) her application changed completely. The time-honored concepts and principles of the great masters of art became the focus and motivation for her paintings. 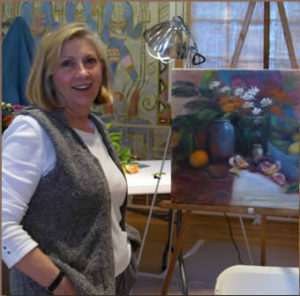 Looking for a place to study, June participated for several years in a painting group at the Ohr-OKeefe Museum, led by Melinda Gandy. This was a great source of inspiration and learning as they studied the great artists, their methods and materials. She is inspired by and continues to study the works and techniques of many great past and present-day artists such as Henri Fantin-Latour, Hovsep Pushman, Nicolai Fechin, David Leffel and Richard Schmid. She has participated in numerous exhibitions, including a showing at the Walter Anderson Museum of Art that traveled to Sausalito, CA, juried by the Fingerhut Museum in Sausalito. June was also one of the Gulf Coast artists included in the “Surviving Katrina” show at the Rentz Gallery in Richmond, VA. In May, 2008, her work was featured in the one-artist show “Estate of the Arts Designer Showhouse”, benefiting the Gulf Coast Symphony Orchestra. In 2009, June was juried into membership of Oil Painters of America and is a member of Women Painters of the Southeast. The Walter Anderson Museum in Ocean Springs, MS., selected her for a one-artist show at their 2012 Gala. She serves as a Regional Director for The National Museum for Women in the Arts in Washington, DC; is a member of Ocean Springs Art Association, Ocean Springs, MS; and participates in various other civic and artistic organizations.